Rose, what did you end up doing with the velvet and grommets? I've never sewn real velvet before, but I understand it's rather difficult to work with (and to iron -- you're supposed to iron it from the underside). Stormcrow, sewing based on a 14th century manuscript has got to be a challenge! I can't even sew with a vintage pattern... all those little dots and no lines. I finished my latest cosplay and am knitting a shawl/scarf right now. I've got a number of things on my mending pile, but that's just not as much fun! Hiya, Morwenna!! I've always been intimidated by the SCA since I tend to hear stories about the absolutely hard-core members who do everything as historically-accurate as possible: period fabrics and materials, hand sewing, etc. I have immense respect for people who can do that, but I am definitely not one of them! On the other hand, I've heard from many other SCA members who don't have standards quite that high but still enjoy it a lot. For now I'm good with Renaissance faires, and I could use a new set of garb as well. I'm happy with my court garb, which I just keep adding things to (seriously, all the stuff than hangs off my belt must weigh five pounds..) but I'd like a set of archer garb, or possibly something like a book merchant. Or both! 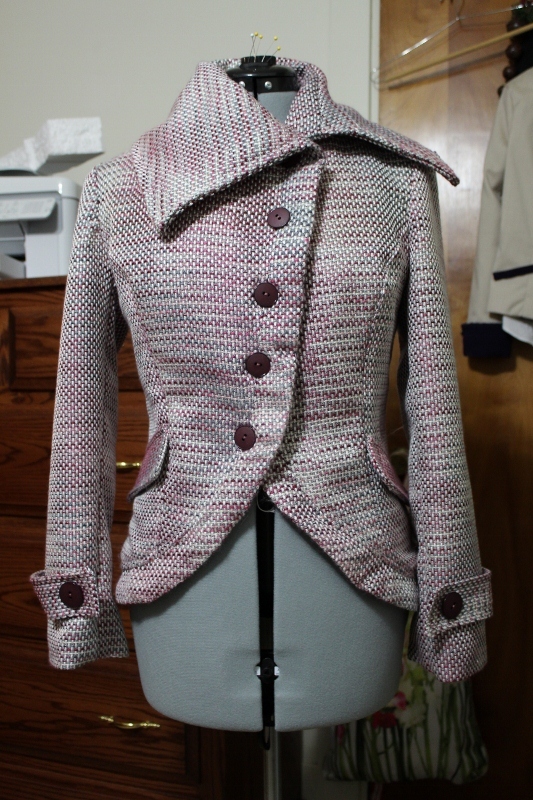 In sewing news, I made a pretty coat! I have a bunch of fabric leftover, so I'm designing a skirt to go with it. I'm in the SCA too! I know a very accomplished seamstress who makes her own period-accurate (modified for female figures) fighting gear, she's wonderful! I'm in school for costuming but haven't taken any classes just yet. I made a giant squid out of jeans if that counts! Just yesterday I bought a dress that had a bunch of elastic in the bust, I guess so it would fit more sizes? it was way too small in the bust for me but I bought it anyways and just took the elastic out, it fits perfectly now! I don't know if that counts though. Well, the Pennsic War is right around the corner and my husband is begging me for new tunics, so I'd better get busy! And all my old overdresses are too tight in the bust now since I gained weight. I can't even find half my fabric. But I can certainly sew up what I do find! *performs CPR on the thread* I think I will sign up for thread notifications, because I always forget to check A&G these days. How was Pennsic, Morwenna? Did you end up making those tunics? Oooooooh man, do I know that feeling. I cat-sat for my advisor for a year while she was in Cambridge on fellowship, and when the cats moved in they gave me these three big plastic tubs to put stuff in (one of the cats likes to eat strings, thread, elastic, etc.) I filled all three with fabric and was so glad when they told me I could keep them. Not sure what I did with all that fabric before I had those tubs!